It’s no secret that Canada has been moving towards banning animal testing. In the past five years, activists have been pushing the Canadian parliament to pass laws that not only eradicate animal cruelty, but also actively push back against foreign industries that support inhumane practices—such as the continuing battle to ban shark fin soup in the Metro Vancouver area. #BeCrueltyFree is just the latest in a long line of campaigns seeking to pressure politicians into examining bills meant to protect our animals. 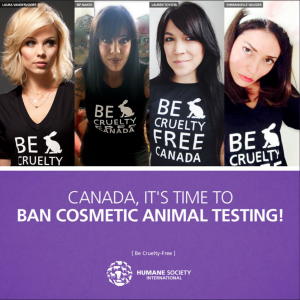 #BeCrueltyFree is actually a global campaign to ban animal testing in the cosmetics market. However, the Canadian branch of the campaign has latched onto a recent bill that is currently being examined in the House of Commons. The #BeCrueltyFree campaign encourages voters to go to their local MP and voice their support of the bill. This is in hopes that pressure from voters will encourage more political support throughout all of Canada. So far, supporting voices for S-214 include a mix of Liberal and Conservative party members. Currently, no politician from the Lower Mainland has officially voiced any opinion on the bill—though it has received significant celebrity support from familiar names such as Laura Vandervoort and Bif Naked. If Canada passes S-214, it will be joining 37 other countries—including the European Union, India, and New Zealand—with similar laws.